The many masks of the Dark Knight. 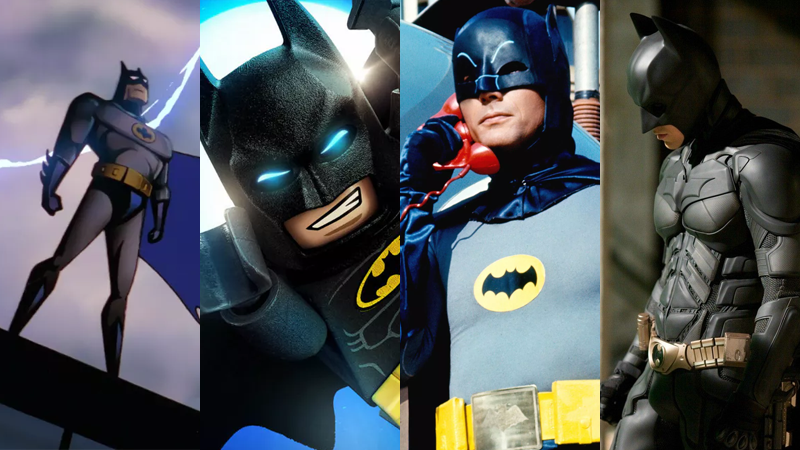 On March 30, Batman—one of the most iconic comic book characters ever created—turns 80. It’s a venerable age for a character that has survived that long, as with most other heroes his age, through ceaseless re-invention. But it can’t help but feel like sometimes, our cinematic lens of the character has begun to stagnate. If you look back at Bruce Wayne’s recent cinematic history, it finds its variety in its shades of a similar grey. You have Christian Bale’s Batman, grounded and grim and so very self-serious, and you have Ben Affleck’s Batman...grounded and grim and so very self-serious, except this time he hates Superman and is pretty okay with killing people. Even Will Arnett’s Lego Batman, as comical as he is, is predicated on the inherent absurdity of taking that grim self-seriousness and cranking it all the way up to parody. Away from the box office, we’re interested in versions of Batman that are cut from similar cloths, whether it is Titans’ nightmare-induced demonic murder-Batman, or Gotham’s zany yet horrifying depiction of the bleakness that forges a young Bruce Wayne into a future Dark Knight. They’re all basically the same thing, all pondering similar ideas: Batman is sad. He’s dark. But to what degree of sad and dark is he? Which is...hardly varied, really. Why the long face, Bruce? Oh, right, the dead parents. There’s a reason for that lack of variance, though. That tragic pathos has been rooted in Batman’s story since the very beginning, a character that is still defined by the fateful night that he lost his parents to a shocking crime. Batman’s inescapable grief has formed the spine of his character in the comics and beyond for so long that interpretations that wallow in that sadness, that embrace it, have become our cultural default. It’s why interpretations like Adam West’s Batman are seen as camp aberrations to be course-corrected from—which is what both Tim Burton’s Batman and even Batman: The Animated Series set out to do—or that Teen Titans Go!’s gleefully giggly take is stuck firmly in the realm of pastiche. Batman can’t be bright, or funny. That’s not Batman to us, he is sad and dark. But what if we admitted that he can be all of those things, and has been over his 80 years of existence, just like Spider-Verse did for Spider-Man? What makes Into the Spider-Verse such a refreshing, transcendental piece of cinema is that it, while utterly revering every inch of the legacy of its focal character, also reminds us that Spider-Man can be so many things, so many people, regardless of the gender, or race, or even kind of sentient being underneath the red webbed mask. Hell, the mask doesn’t even have to be red and webbed! Even if there are things that unite the myriad heroes of Spider-Verse together—much like Batman, the tragic loss of someone dearly close to them—over generations of existence Spider-Man has been so many different things across a plethora of so many different mediums. And those different mediums have given us so many different stylizations of Spider-Man, just as different mediums have given us so many different versions of Batman. Imagine if we got a movie that showed just that, and flung together the variety of Batmen, Batwomen, and Bat-People—perhaps even the Man-Bats—that have been presented to us over 80 years of stories, into one glorious mish-mash crossover? The hero that Batusi-boogies is just as crucial to Batman’s history as the hero who is both vengeance and the night. So when I say that Batman needs his Into the Spider-Verse, I don’t necessarily just mean that Batman needs an Oscar-winning, kickass technicolor dreamcoat of an animated movie. I mean, I do, because that’d be really nice—and if rumors are to be believed, there are already alleged plans under the way to attempt to make an Into the Bat-Verse-esque project with Batman Beyond’s Terry McGinnis. But what I actually mean is that I want a film that, like Spider-Verse, acknowledges the variety of Batman beyond simply the tortured soul in a black cowl and cape. 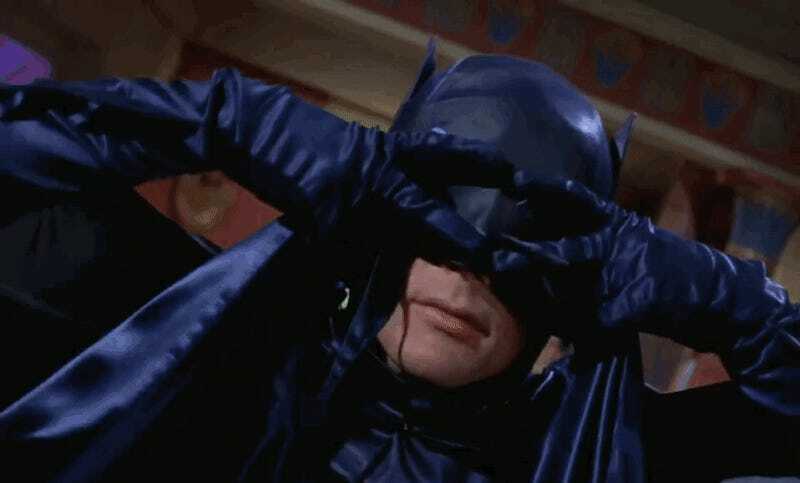 Batman’s legacy is that tortured soul, but it is also Adam West’s Bright Knight. It is the genius detective we met in those hallowed pages of Detective Comics #27, but it is also the metatextual machismo of Lego Batman. It is Ben Affleck’s bat-branding slab of muscle and rage—regardless of how brief the time he spent under the cowl in the end—but it is also Kevin Conroy’s swashbuckling noir hero. It is, pushed far enough, a legacy that encapsulate heroes that have grown into their own legacies beyond Batman, like Barbara Gordon and Kate Kane, or the aforementioned Terry, and the rest of the Bat-Family. He’s a character with now 80 years of history, of re-interpretation and re-invention under his utility belt. So why do our cinematic interpretations of him always lean on such a narrow perspective of the character? What better way could there be to celebrate eight decades of adventures than a reminder that Batman can be so much more.